Avascular necrosis is defined as the localized death of cells in the bone due to lack of blood supply to it. It results in weakening or collapse of the bone. 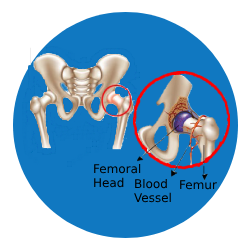 It is also called osteonecrosis or ischemic bone necrosis and most commonly occurs in the hip. The other common sites include shoulders, knees and ankles.